One thing that we are learning so far is that CAI’s partners would like more support with front-end creative planning. Adaptation requires more than backward looking analytical processes, which consider how the context has changed or what we have learned that renders our strategies obsolete. Adaptation is also promoted by a forward looking commitment to responsible experimentation. This requires asking ourselves, in an uncertain environment, how we will try to achieve our goals in the coming months, and how we will know (in a timely fashion) whether our hypotheses were correct. The powerpoint above served as the basis for a half day training in creative planning for adaptive management. The training builds on an earlier process of strategy testing, which helps CAI’s partners understand which of their strategies are or aren’t working based upon how the context is changing and what they’ve learned, but doesn’t necessarily inform them what (or how) they should do things differently. The first involves breaking down the question of “what should we do” into smaller inquiries in breakout groups that generate a rich set of response opportunities. The second prioritises these responses based upon their feasibility and potential and articulates the resources and relationships needed to implement them. The third considers how we will learn in close to real time whether or not these responses are proving effective. We can increase our chances of developing effective strategies amidst uncertainty by utilising the evolutionary principles of variation and selection. In practice, this meant breaking up a larger question into smaller ones, and breaking teams into smaller groups or individuals in order to generate larger numbers of responses that draw out more diverse perspectives. When a larger set of responses are elicited, given equal air time, and selected by the group, the likelihood that better ideas will surface and be selected for increases, especially when strong hierarchies prevail. Simple tools can be helpful in complex environments. The first approach to this training was mechanistic, using a points and ranking approach to determine feasibility, assess potential impact, and prioritise potential strategies. Although it might vary by context, for this group a simpler set of questions that could be discussed in group was preferred to a more complicated ranking approach. Does it matter and why? Which strategies are affected and how? How should we communicate this (to donors, partners, beneficiaries)? 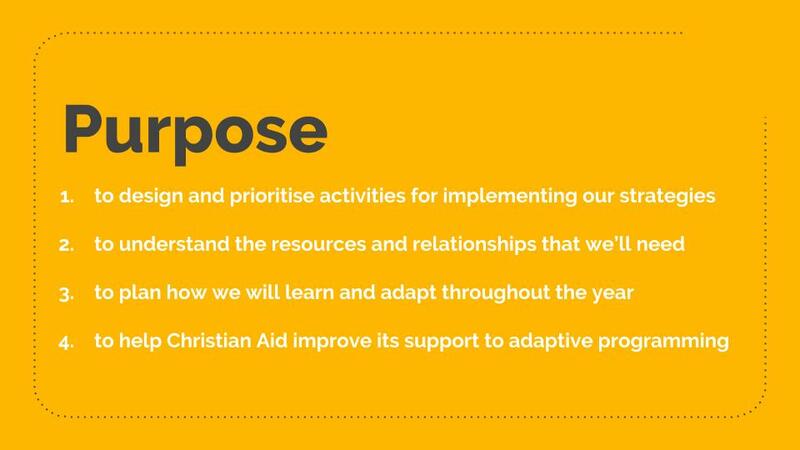 This work is part of a three year partnership with Christian Aid Ireland to support implementation and learning from adaptive programming. We welcome any suggestions as to key research questions regarding the effectiveness of adaptive programming that this research might explore.